This tasty, versatile granola makes a great breakfast or pudding when served with compote, yogurt and fresh fruit. Granola usually contains dried fruit but this one doesn’t because dried fruit is high in fermentable carbohydrates and can upset a sensitive gut. Recent research at the Monash University, Australia have investigated diet and IBS symptoms and focused on a large group of dietary sugars called FODMAPS (Fermentable oligosaccharides, di-saccharides, mono-saccharides and polyols). These sugars can be poorly absorbed in the small intestine and fermented by bacteria to produce gas which can lead to pain and bloating in people with a sensitive gut. Many fruit contain FODMAPS but the fruit in the granola pots contain very few. Most people can eat small portions of raspberries, strawberries, blueberries and Kiwi fruit without experiencing symptoms. Many cereals also contain FODMAPS but oats and oatbran contain only small amounts. The portion sizes recommended here should not cause symptoms in most people. 100g mixed fruit e.g. blueberries, strawberries, raspberries and kiwi fruit. Method Preheat the oven to 200C/Gas mark 6. Place the rolled oats, nuts and seeds in one bowl. In another bowl whisk together the maple syrup, vegetable oil and vanilla essence. Pour the maple syrup mix over the oats, nuts and seeds and mix together with your hands making sure the oats are well covered with the maple syrup and oil mixture. Spread the oats, nuts and seed mixture on a baking tray and bake in the oven for 15 minutes. Half way through the cooking time open the oven door and stir the granola and check it is not scorching in one place. Continue cooking the granola until it just turning golden brown. Do not be tempted to cook it for too long. Granola is better slightly undercooked than over cooked. For the compote: rinse the strawberries, remove the green calyx and roughly chop. Place the strawberries in a saucepan with a little sugar, water and lemon juice and cook gently for 5 minutes. They should be soft and well cooked. Allow to the strawberries to cool. 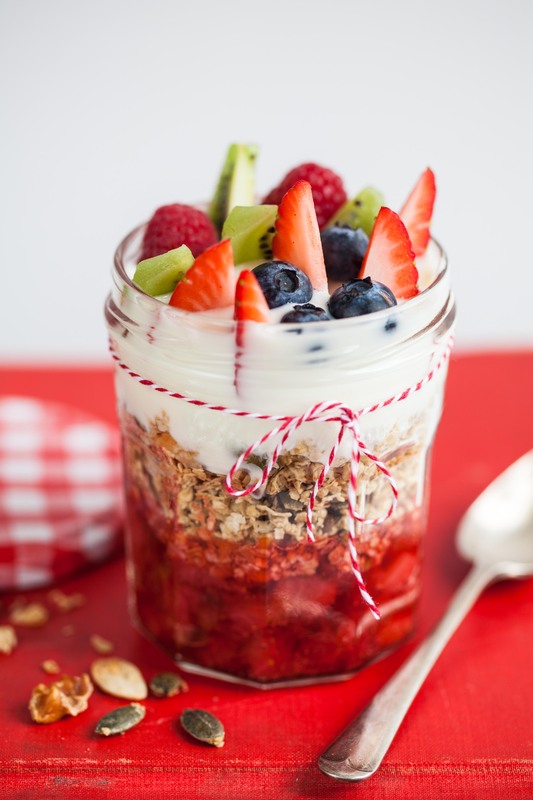 To assemble the granola pots: place a tablespoon of strawberry compote in the bottom of a glass serving dish, followed by a sprinkling of granola and top with lactose free yogurt and a selection of chopped fruit i.e. blueberries, strawberries, raspberries, kiwi. NB A serving of this contains 23g serving of oats which is low in FODMAPs and should be tolerated by most people. 02 Jul	This entry was written by Joan Ransley and published on July 2, 2014 at 2:21 pm. It’s filed under Pudding, Snack and tagged FODMAPS, fruit, granola, lactose free. Bookmark the permalink. Follow any comments here with the RSS feed for this post.